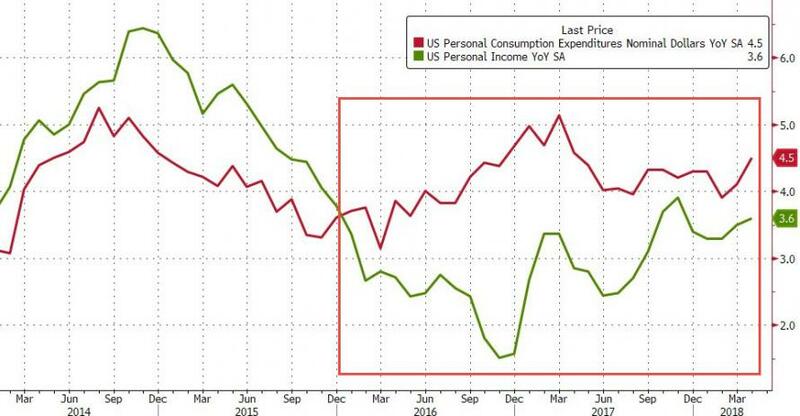 While US personal incomes grew, as expected, at 0.3% MoM, Americans resumed spending fare more than they make (increasing 0.6% MoM in April). For the 28th month in a row, YoY growth in spending has outpaced incomes, sending the savings rate back down to just 2.8, the lowest since the debt-funded holiday spending spree of December 2017, and just shy of record lows. Adjusted for inflation, real consumption rose 0.4%, double the median projection of 0.2%. The Commerce Department said spending for gasoline and other energy goods, as well as household utilities, were leading contributors to the monthly increase in real outlays. Real durable goods spending, rose 0.3% after a 1.9% increase in the prior month; nondurable goods advanced 0.4% for a second month. Outlays on services, adjusted for inflation, rose 0.4% after a 0.3% gain in prior month. 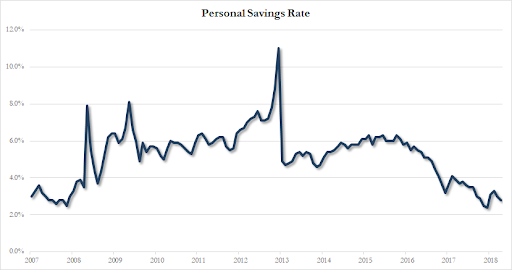 And at the end of all this, spending more than you're making sent the savings rate back down near record lows. 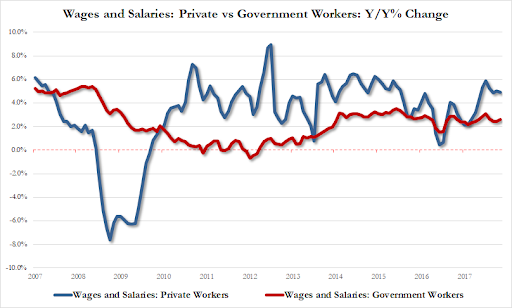 Meanwhile, looking at the inflation side of things, the PCE Deflator, or headline spending - the Fed's preferred inflation indicator - rose 2.0% Y/Y, in line with expectations, while core PCE rose 1.8%, a drop from last month's original 1.9% print which was however revised lower to 1.8%. Yet curiously, on a monthly basis core PCE rose 0.2%, or more than the 0.1% expected.